April 1st at the Vashon Farmers Market 10:00-2:00 Orca Eats will have a breakfast-brunch option, freshly dripped coffee, lunch, and dessert on the curb at Vashon's Village Green. Vashon Island Growers Association (VIGA) brings you the market with dozens of farm, food and craft vendors. Click HERE for info and to sign up for VIGA's weekly Fresh Sheet delivered to your inbox. Rain or shine, we'll see you there! Suspended Cafe - we're one! either a cup of coffee, other beverage, entree or dessert. We've debated serving coffee from the beginning. Some of us don't want/need a cup or two in the morning, but serving at the farmers market at 10:00 am and horse shows much earlier in the morning, we've realized it just makes sense. So we'll be serving fresh dripped coffee this year! It's ok to say "I told you so." We're glad it's here: a brand new year full of promise and adventure. 2016 was the year of the permits: our "golden ticket" affixed permanently to Oona the food truck, and our Seattle King County Department of Public Health permit for 2016. The golden ticket shows the world that Washington State Labor & Industries deems the truck well built and safe to function for the public and staff. It's lovely to have propane, electrical and plumbing systems! The Health Dept. permit is all about keeping cold foods cold, hot foods hot, prepping and storing foods correctly in our commissary kitchen and the food truck, and staff's knowledge of food safety. It's our goal to pass every inspection with flying colors ... so far so good! We have our food handlers cards in our wallets and our phones, and we prep and serve with food safety, great flavor and hospitality in mind! We rang in 2017 at the Open Space for Arts and Community's Black Light Ball. The DJ's were spinning great danceable music for a couple hundred islanders and friends of all ages. Orca Eats served deep fried mac and cheese, seafood chowder, caramel sundaes and cream filled chocolate cupcakes. Our truck-made ginger ale and hot spiced cider quenched the thirst of the dancers! Did we mention we're farming? Yes! To bring you the freshest local produce. and then it's winter hibernation until April 1st. Can hardly wait to see you and feed you then! Follow us on Facebook and Instagram to see what's cooking for the new season. Top left: deep fried mac & cheese with Orca ketchup. Lower left: seafood chowder with puffed pastry. Right: "mostess" cupcakes - chocolate with cream filling, ganache. 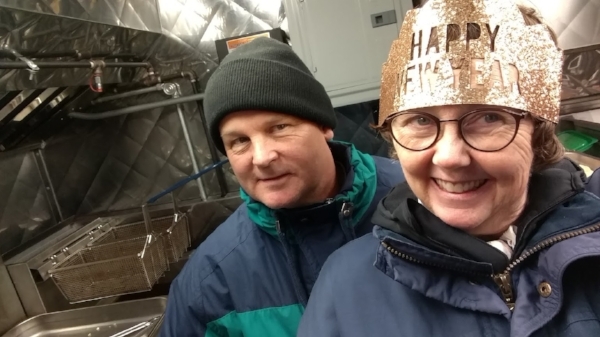 We were bundled up against the cold... and the fryer helped warm us, too! Join in the festivities as we welcome Santa and light Vashon Town's tree to kick off the Holidays! Orca Eats will be on the Highway with hot food and beverage at 5:00. Whether you're in the parade or waiting to greet Santa and Mrs. Claus when they arrive at the tree, we'll see you there! Santa's parade will head East on Bank Rd. from 100th, turning South on Vashon Highway to Saucy Sisters' Pizza. Parade kicks off at 5:30. Treelighting to follow. The orca truck will be out one more Saturday for lunch, on November 19th from 10:00-2:00 at the Vashon Farmers Market. We'll be out for a few dates in December, then Orca Eats will hibernate until 2017. Of course orcas don't really hibernate, but you can read about how they sleep here. HOORAY -- On the Streets of Vashon! We got the definitive answer from the County Sheriff's office, Seattle King County Department of Public Health: we can park and vend to the public on any public street so long as we are parked legally, we can vend on the street! So yes, we will be on the Vashon Highway between Bank Road and the Village Green this weekend Friday, Saturday (at the Farmers Market) and Monday. The Park District is happy, Sheriff's office and Health Department are all happy. Top left: at CiderFest while the crowds were tasting and staying dry at The Lodges. Right: Litas enjoying lunch sitting on the bumper - easier than sitting on a motorcycle. Bottom Left: lovely Peruvian lilies from a kind lunch couple at the IGA lot. CiderFest! Olympus Pony Club Horse Show! Litas at the IGA Parking Lot! It's been a busy, fun weekend. Seeing the horses and riders at Paradise Ridge Park warming up for their dressage tests in the morning, serving coffee and sausage-egg-n-cheese breakfast bake, pulled pork sandwiches, rosemary chicken, hot sweet potato soup and chocolate cupcakes throughout the day. One family needed a bandaid, and we supplied it. Just so you know, a kitchen/food truck first aid kit is well equipped for cuts and burns! The nice bandaid family came for lunch, then the dad came back on his own -- "I thought the kids would share with me, but they all loved your food so I'm here to get my own lunch!" Thank you, nice horse show dad, for bringing your kids and yourself for lunch! And I'm glad to know the bandaid helped the young rider. CiderFest is VIGA's annual early October celebration of all things apple and cider. This year the hard cider tasting was at The Lodges on Vashon. The event featured ciders from orchard based cideries focusing on selecting high quality apple varieties: Dragon's Head Cider, Nashi Orchards, Vashon Winery (Irvine's Vintage Cider), Whitewood Cider, Alpenfire Cider. Seattle Distilling Company poured a cider cocktail. The raves from the attendees was exciting, complete with detailed descriptions of favorites, shocked questions of "you haven't been in to taste?!" and a whole lot of food being served from Orca Eats. Danny Newcombe and The Sugarmakers and The Rumba Strips performed. It may have rained for a while, but it didn't seem that spirits were dampened (pun intended). It was very nice to be asked to be the food vendor, and we hope everyone had as much fun as we did at CiderFest! Hopefully next year it won't rain! Sunday brought a few Litas (lady motorcyclists) to Orca Eats while on their tour around Vashon. They saw the lighthouse and beach at Point Robinson, the bike in the tree and had a blast zipping around the country roads of Vashon Maury Islands. Thanks for stopping by for lunch! We're doing it! Fridays, Saturdays, Sundays and Mondays you can usually find us open for lunch from 11:30-2:00 in the Vashon IGA Market parking lot. Check the Where? page for the most up to date location and schedule info, and the Menu page for the current menu. It's fun driving the big truck on the Vashon Highway. Some people wave. Some look right through us. The push-button horn on the food truck makes a clown-car sound... wave and you may just hear it! • Overloading the generator and not knowing how to flip the generator's breaker. It's easy now that the little tiny switch has been pointed out! • Getting boxed into our parking place at night in a completely dark parking lot. Thank goodness for great headlights, reverse lights and a big flashlight! • Forgetting to lock the refrigerator door in the food truck.... just kidding, it's never come open when going around a corner! But we do have to pack the fridge carefully for the daily drives, and lock it in case it did try to open on the road! • When calling a staff member to coordinate driving and parking at a large catered wedding and she says "that's next week, right?" and it's that same day. It's ok! Someone else took her place, and it all worked out fine. • When a staff member doesn't arrive, the boss lady sends a terse text "where are you? Not sure this is working between you and me." And then she shows up only to show the dumb boss lady that she really was scheduled to start later. Sometimes hard work and changing schedules makes for goofy details! Home, sweet parking lot. At Vashon Market IGA's lot - right by the BofA atm, across from the post office, just a block off Vashon Highway, uptown.